Inside the activity room at the Extended Care Unit at Niagara Health’s Welland Site, Mary Lou McIvor is singing The Beatles’ song She Loves You. 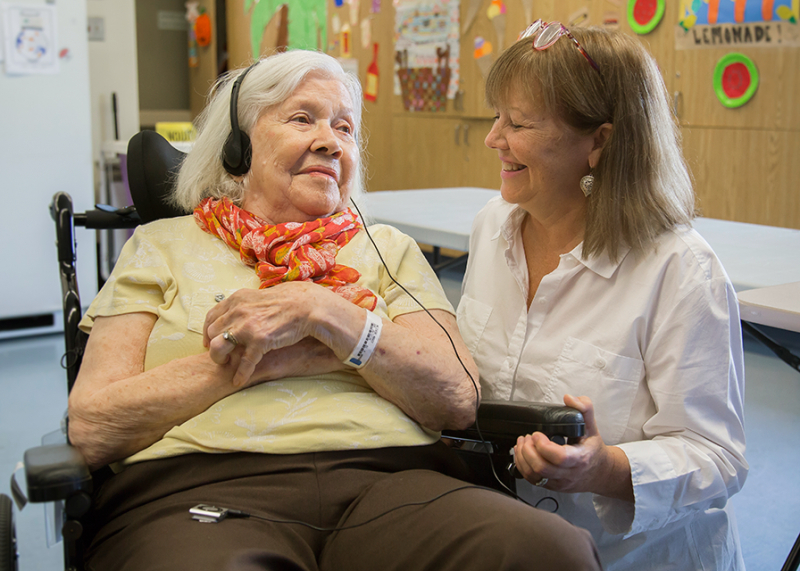 The 81-year-old is wearing headphones and listening to music on an iPod as part of the long-term care home’s Music and Memory Program. Her playlist features songs from some of her favourites performers: Ella Fitzgerald, The Beatles and Aretha Frankin, to name a few. The singing is intermittent, and beautiful. In between singing, Mary Lou is smiling, content, with her eyes closed. The Music and Memory Program has made a big difference for Mary Lou and other residents at the Extended Care Unit (ECU). Mary Lou, who has Alzheimer’s disease, sometimes has difficulty communicating. But when the music plays, her singing voice is easy to understand. Growing up, her daughter Cathy Thompson remembers her mom singing often around their home in Aylmer, Quebec. Mary Lou worked for the federal government in Ottawa during the week and often had singing gigs on the weekend. "I think the fact the program is available is wonderful," says Cathy. "Music has always managed to put Mom in a great mood and she has spent a lot of her life around music. It’s such a spirit lifter." Residents with cognitive impairments like dementia can sometimes experience agitation and depression. The ECU staff and Brock University students introduced the Music and Memory Program to enhance the quality of life for residents. The team works with residents and families to create personalized music playlists. The program has helped to improve the mood and behaviour of residents and has been effective in reducing incidence of falls by creating more relaxing environments. "It’s amazing when you see someone who really responds to the music and you see their face brighten and their eyes twinkle or a smile comes across their face," says Lezlie Leduc, the ECU Program and Services Manager. "We are using these techniques more to try and manage the behaviour. For example, when a staff member sees a resident is agitated, they get the music and it creates a calming process for the individual." Cathy says seeing Mary Lou’s reactions while listening to music "melts my heart." "It makes me feel so happy. I know she’s happy when she’s singing,” says Cathy. “Before she had the music, she seemed kind of down. It was as if something might have been missing because she always had such a connection with music. It has really changed her mood. She is now more at peace." One day, Mary Lou was listening to music on her iPod while other residents were doing crafts. Mary Lou started singing The Beatles’ song All You Need is Love, and her fellow residents joined in, another testament to how music can elevate people’s moods. Julie Horton, a Recreation Therapy Assistant at the ECU, works with residents and their families to create the musical playlists. The Music and Memory Program is seeking donations of iPods or other MP3 players. If you have one to donate, please email Lezlie Leduc Lezlie.Leduc@niagarahealth.on.ca or call her at 905-378-4647, ext. 34585. Music and Memory is part of the Interprofessional Education for Quality Improvement Program (I-EQUIP), which pairs students from Brock and McMaster’s School of Medicine - Niagara Campus, with staff from Niagara Health to work together on health system improvement. Students from the Niagara Catholic District School Board's Niagara Launch Centre designed and fabricated the Music and Memory storage cupboard. We are very grateful to the students for this generous donation.